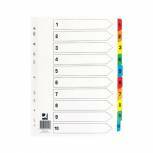 Q-Connect 10-Part Subject Divider Multi-Punched A4 KF26082 Pack of 1 Q-Connect Subject Dividers. Colour coded, multi-punched dividers suitable for use in most types of binders. Individually shrink wrapped to ensure dividers are kept in good condition. Size: A4. 10-Part Plain Multi-coloured. 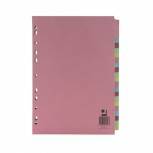 Q-Connect 5-Part Subject Divider Multi-Punched A4 KF26081 Pack of 1 Q-Connect Subject Dividers. 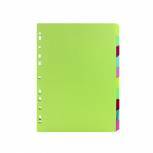 Colour coded, multi-punched dividers suitable for use in most types of binders. Individually shrink wrapped to ensure dividers are kept in good condition. Size: A4. 5-Part Plain Multi-coloured. 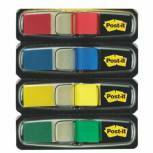 Post-it Index Tabs Sign Here Yellow (Pack of 50) 680-9 Pack of 1 For convenient marking of areas of documents that require a signature. Can be removed and reused. Ideal for solicitors, lawyers, legal departments etc. 50 per dispenser. Q-Connect Multi-Punched January-December Reinforced Multi-Colour A4 Index Pre-Printed Tabs KF01524 Pack of 1 Q-Connect White Board Multicolour Tabbed Indexes with a matching contents page, perfect for clear professional presentations, reports and projects. Manufactured from White board with mylar reinforced tabs and punched holes for durability. Jan-Dec..
Q-Connect Multi-Punched A-Z 20-Part Reinforced Multi-Colour A4 Index Pre-Printed Tabs KF01523 Pack of 1 Q-Connect White Board Multicolour Tabbed Indexes with a matching contents page, perfect for clear professional presentations, reports and projects. Manufactured from White board with mylar reinforced tabs and punched holes for durability. A-Z. 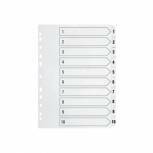 Q-Connect 12-Part Subject Divider Multi-punched A4 KF01515 Pack of 1 Q-Connect Subject Dividers. 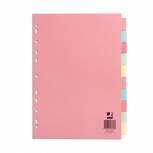 Colour coded, multi-punched dividers suitable for use in most types of binders. Individually shrink wrapped to ensure dividers are kept in good condition. Size: A4. 12-Part Plain Multi-coloured. 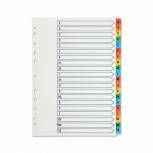 Q-Connect 20-Part Subject Divider Multi-punched A4 KF01517 Pack of 1 Q-Connect Subject Dividers. 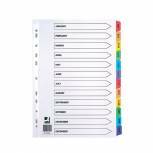 Colour coded, multi-punched dividers suitable for use in most types of binders. Individually shrink wrapped to ensure dividers are kept in good condition. Size: A4. 20-Part Plain Multi-coloured. Q-Connect 1-20 Index Multi-punched Polypropylene White A4 KF01356 Pack of 1 Q-Connect White polypropylene Index. Manufactured from hard wearing polypropylene complete with contents page, ideal for frequently referenced material in the office or factory environments. Multipunched for use in most binders. 1-20. 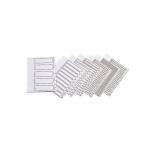 Q-Connect 20-Part A-Z Index Multi-punched Polypropylene White A4 KF01351 Pack of 1 Q-Connect White polypropylene Index. Manufactured from hard wearing polypropylene complete with contents page, ideal for frequently referenced material in the office or factory environments. Multipunched for use in most binders. A-Z. 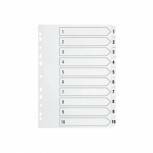 Q-Connect 1-10 Index Multi-Punched Reinforced Board Clear Tab A4 White KF01528 Pack of 1 Q-Connect White Board Clear Reinforced Indexes, ideal for numerical filing. Manufactured from White board with clear mylar reinforced tabs and punched holes for durability. With contents page for cross reference. 1-10. 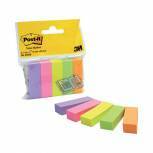 Post-it Small Index 12mm Standard Colours (Pack of 140) 683-4 Pack of 1 Post-it Small Index. Ideal for colour coding documents. Easy to write on transparent surface. Can be used to refill any Post-it index dispenser. Repositionable. Size: 12mm. Colour: Assorted. 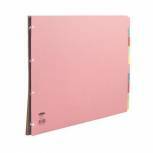 Q-Connect 1-31 Index Multi-punched Reinforced Board Multi-Colour Numbered Tabs A4 White KF01522 Pack of 1 Q-Connect White Board Multicolour Tabbed Indexes with a matching contents page, perfect for clear professional presentations, reports and projects. Manufactured from White board with mylar reinforced tabs and punched holes for durability. Tabbed 1-31. 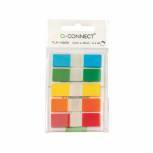 Q-Connect Page Markers 1/2 Inch Assorted (Pack of 130) KF14966 Pack of 1 Brightly coloured half film page markers help with bringing attention to important text. Easy, single release from convenient fan fold dispenser. Available in an assorted pack of Blue, red, yellow, green and orange. Each tab is 1/2 inches (12mm) wide. 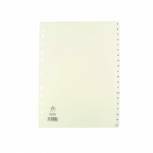 Q-Connect 1-10 Index Multi-punched Polypropylene White A4 KF01353 Pack of 1 Q-Connect White polypropylene Index. Manufactured from hard wearing polypropylene complete with contents page, ideal for frequently referenced material in the office or factory environments. Multipunched for use in most binders. 1-10. 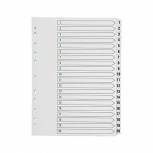 A4 White A-Z Polypropylene Index WX01351 Pack of 1 Set of 20 A4 dividers alphabetically marked (A-Z). Ideal for sorting and organising papers. Punched to fit most standard A4 files. Made from clean and durable polypropylene. Ideal for alphabetical filing. 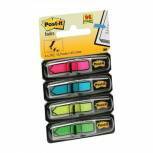 Post-it Page Markers Assorted (Pack of 500) 670-5 Pack of 1 Repositionable marker ideal for bookmarking pages and sections in books, catalogues, forms, files etc. Supplied in five assorted colours - pink, yellow, green, purple and orange. 100 page markers per colour. Size: 15 x 50mm. 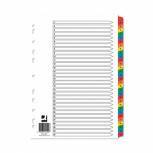 Q-Connect 1-10 Index Multi-punched Reinforced Board Multi-Colour Numbered Tabs A4 White KF01519 Pack of 1 Q-Connect White Board Multicolour Tabbed Indexes with a matching contents page, perfect for clear professional presentations, reports and projects. Manufactured from White board with mylar reinforced tabs and punched holes for durability. Tabbed 1-10. 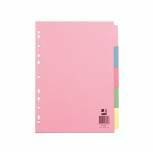 Concord 10-Part Subject Divider Oblong A3 Assorted 70499/J4 Pack of 1 Assorted colours or White dividers. Organise file contents by Subject using a different divider for each Subject. Write or type onto tabs to create individual indexing systems. Functional and easy to use for office or school. Assorted A3 10 part oblong. 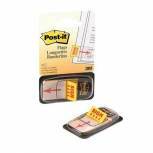 Post-it Index Arrows Standard Assorted (Pack of 96) 684-ARR3 Pack of 1 Post-it Index Arrows. Ideal for highlighting pages and text. Repositionable and transparent. 12mm wide. Standard pack. 24 arrows of each colour. 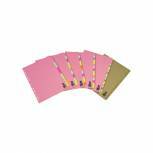 Multicoloured A4 10 Part Divider WX26082 Pack of 1 A4 Manila dividers are ideal for filing. Each tabbed page is a different colour, so you can colour code your documents easily. Tabs have been left blank to add your own labels. Multi-punched to fit any standard folder or file.